Recent number crunching from a national test prep company shows that Virginia public school teachers are among the best paid in the country. USATestprep compiled data from the Bureau of Labor Statistics, Forbes, and other outlets on teacher pay, local taxes, and cost of living. Based on their calculations, Virginia cracks the top 5 states for pay when cost of living and taxes are factored into the numbers. 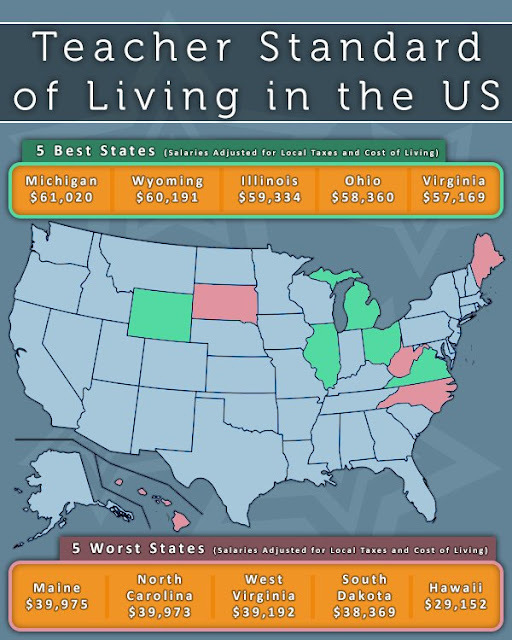 However neighboring states West Virginia and North Carolina are among the worst in the nation. Wyoming one of the reddest states in the union, is also one of the best paying states for teachers. More details on their methods and sources can be read here.